Whether you're actually in Italy, or in some far off place, Italy can be found! Italy Project brings you advice on Italy, Italian cultural tidbits and personal ramblings about the everyday Italian life. 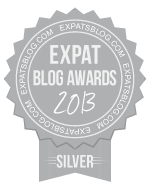 ExpatsBlog.com Expat Blog Awards 2013: Italy Silver Award!